A week or so ago, our son, Mickey, came into the city for a Diana Krall concert and although we had planned to go out to dinner, much to my delight he decided to cook. What a joy! Off we went to the market and when we got back laden with shopping bags, Steve got the camera and I got my knife to be his sous chef. After dinner, when Mick and Steve went off to the concert, I did the dishes and thought how lucky can any one mother be. 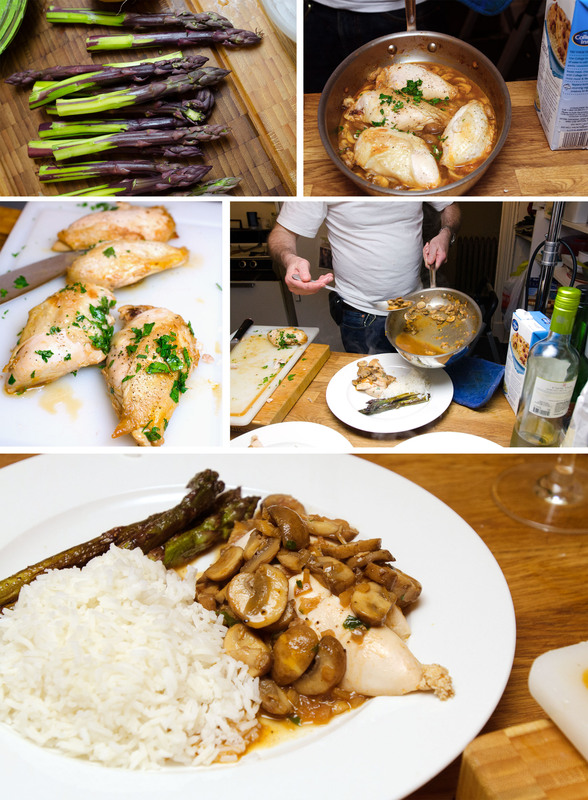 Here’s what he made – this is Mickey’s idea of an easy Friday night dinner celebrating spring. 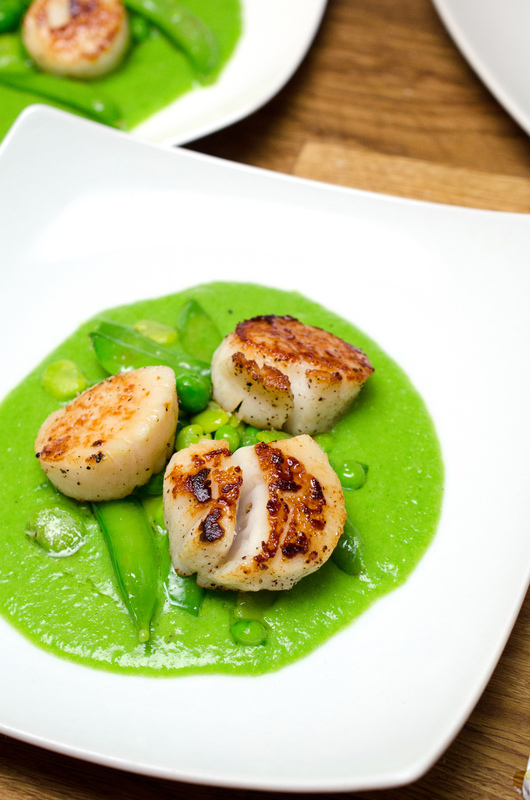 Seared Scallops on Pea Puree with Spring Vegetables: Fresh peas steamed and pureed with a little broth and salt and pepper. 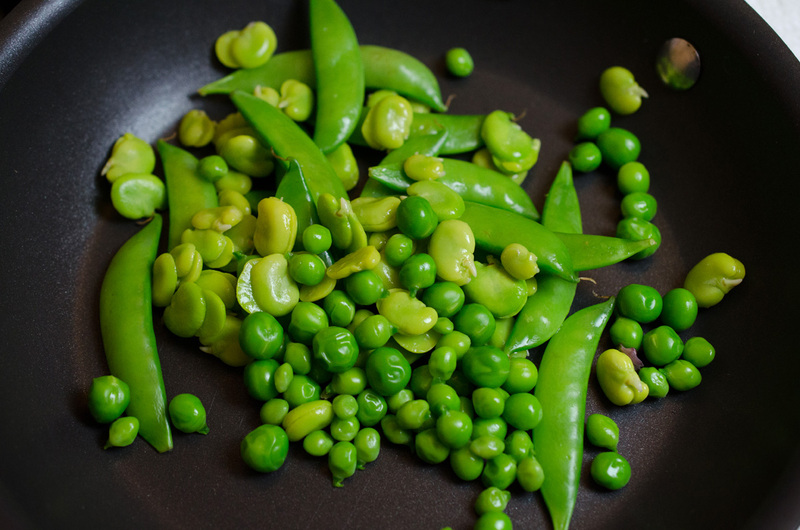 Fresh fava beans, snap peas, and garden peas lightly sautéed in a bit of chicken broth and butter. Scallops seared for a couple of minutes to caramelize nicely and still be almost raw in the center. The puree was spooned into the center of each of our plates, the sautéed veggies scattered about and 3 scallops nestled in the center. It was light and delicious. Roasted Chicken Breast with Mushroom Sauce, grilled purple asparagus, and basmati rice: Whole chicken breasts were roasted with the skin on until just barely cooked; then, deboned and skinned. A lovely sauce of mushrooms, marsala wine, herbs, and stock was made and the chicken breast halves added for just a couple of minutes to warm and season. The asparagus was grilled. The rice cooked and dinner was served. I felt as though I had eaten in a starred restaurant with none of the associated hype. How lucky indeed?! I wonder who inspired him over the years! I wouldn’t know!!!!!! But he sure can cook….. While the rice is cooking, heat a pan (I recommend that you do not use non-stick) over high heat. Add 2-3 tablespoons olive oil. When the oil just begins to smoke, add 12 large scallops which have been thoroughly dried, salt and peppered. We eat a lot of chicken and I always have some leftover. Even a single chicken breast will leave me with a few scraps, so I am always looking for ways to use the odds and ends that are stored in the fridge. One of my frequent go-tos is fried rice – I always dread taking the time to make all the mise en place (those little bowls of prepared ingredients that decorate a chef’s work table) – precooking the rice, shredding the chicken, julienne carrots, bias cut scallions, diced peppers, tiny broccoli flowers, fresh peas, whatever I can find laying around that will extend the rice mix to a single dish dinner. But, once I’ve done all the work, the rice comes together in a flash. Here’s what I do: Add a bit of grapeseed oil and sesame oil to my treasured wok (from The Wok Shop in San Francisco’s Chinatown, (www.wokshop.com) that is burning hot. I quick scramble up a couple of eggs with some grated ginger and garlic, throw in the rice, add a mix of soy sauce and chili sauce, followed by the veggies – the toughest ones first down through the list ‘til at last the scallions get a quick turn into the mix. Pile it high on each of our plates and then we chopstick our way to fried rice heaven. I have to admit that I once made chicken fried rice for friends and forgot to add the chicken so forevermore my chicken fried rice is known as chicken fried rice without chicken! It was still delicious no matter what my buddies say. Oh yes, this is an amazing dinner. I could bathe in this risotto and use the scallops for pillows. This recipe doesn’t make quite that much, but it happily filled our bellies and left more lunch tomorrow, huzzah! I bought the scallops weeks ago in anticipation of this meal but just hadn’t had a chance to gather the rest of the ingredients. The final touch was a batch of fiddleheads, which I have heard of, seen, but have never made. I used quinoa for this risotto because we have a lot of it on hand and I thought it would be something unique, and it worked perfectly. Like mother, like son. Or perhaps like son, like mother! Mickey, my literary agent, is a 4-star delight.